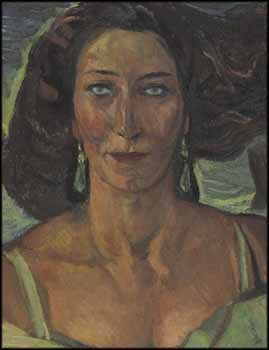 It is well known that Frederick Varley's relationships with his models were complex. Some were simply sitters, children of friends or his own children, others were wives of fellow artists and friends, or students. It is also known that with some of these, he had physical relationships. Varley was conversationally adept, and he had an ability to engage women he was attracted to in intense discussions on subjects such as art, creativity, personal growth, marriage and relationships. At a time when the role of women in society was undergoing fundamental change, many of these women had expectations for their lives outside of marriage and domestic life. Varley's portraits of these women are thus records of a unique time, when Canadian women became the catalyst for enormous change within their personal value systems as well as in their greater societal roles. Reva Brooks, who was later to become an internationally known photographer, recalled that it was Varley who first "tried to convince her to awaken her artistic nature and devote more time to things that were important to her growth, instead of just being happy as a wife." Katerina Atanassova wrote that Natalie Kessab - our Natasha - was "probably the most mysterious woman ever to enter the painter's life. Said to be of Lebanese or Armenian descent, she had exotic, Oriental features." She was also financially independent, divorced, and the owner of a lingerie shop in Montreal. Natasha was referred to by Peter Varley as a woman who was "the ideal type to awaken Dad's gypsy soul. We know the whereabouts of one head of her, but another has vanished. It was a striking, fearsome portrait - fiery eyes, a flame of hair, torso nearly bare...Natalie was the only woman Dad couldn't get the better of." Our Natasha is the vanished head, and she is fiery indeed. There is more here than a gorgeous woman caught in a storm of green - there is another storm in this picture, and it is between the artist and the model. Whether it is brewing and building, holding itself at a steady state, or dissipating and dying is Natasha's secret, but it is there and very real, caught in a painter's moment in a perpetually frozen state, in the look in Natasha's eyes. Even her hair seems caught in a maelstrom, flying up and away, tossed by the energy that is otherwise contained. Varley's brushwork is such that Natasha is almost a sculpture. Literally moulded in paint, her tanned, olive skin is highlighted with the characteristic greens that we so often see in varying amounts in Varley's works, but which dominate here. Natasha's earrings, her dress, her skin and the background, which is rather ambiguous, are all green. Is she in front of a churning sea or caught in a windswept forest? The trunk-like form on the right seems to suggest the latter, but it is the feeling in the work that comes across most strongly, that of a contained storm. Natasha leans slightly towards and looks directly at us with her heavy-lidded gaze. Is she about to speak? Has she just said something and is she watching the artist's reaction? Natasha is statuesque, sensual and absolutely self-assured. Her forceful presence seems to be contained just enough not to explode from the work - she is a storm composed. The original title of this work was A Lady of Antioch, which might refer to Philippa of Antioch, a princess who was the mistress of Adronicus I Comnenus, a Byzantine emperor who spent his life fleeing from the displeasure of various courts as a result of his seduction of numerous women. Another portrait of Natasha, titled simply Natalie, was painted in 1943 and is now in the collection of the Frederick Horsman Varley Art Gallery in Markham, Ontario. Natasha is #690 in the Varley Inventory listing, titled as Natalie, circa 1943.